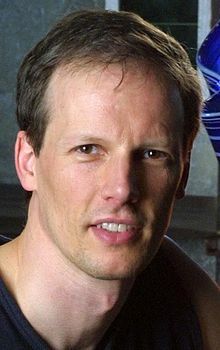 Jim McKelvey is an American entrepreneur, businessperson and philanthropist. Jim was appointed as an Independent Director of the St. Louis Federal Reserve in January 2017. James Morgan (Jim) McKelvey Jr. was born and raised in St. Louis, Missouri and is a Distinguished Alumni of Ladue Horton Watkins High School. He wrote and published a Handbook on UCSD and Apple Pascal. After graduation from Washington University in St. Louis, McKelvey worked at IBM's Los Angeles Scientific Center and was simultaneously a glassblowing instructor and founder of Disconcepts, a CD cabinet manufacturing company. In 2000, after giving a glassblowing demonstration at WUSTL, McKelvey met Doug Auer. In 2002 they founded Third Degree Glass Factory in St. Louis, a glass art education center and studio. In 2009, McKelvey co-founded Square with Jack Dorsey. McKelvey designed the hardware used by Square in 2009 and served as the company’s chairman until 2010. In 2011, McKelvey's iconic card reader design was inducted into the Museum of Modern Art. Today, McKelvey sits on the Board of Directors at Square. In 2012, McKelvey teamed with St. Louis-based serial entrepreneurs Brian Matthews, Clifford Holekamp, Peter Esparrago and Rick Holton to found Cultivation Capital. Their venture capital firm manages three funds: an early stage tech fund, an early stage life sciences fund, and a series A growth fund. In May 2016, McKelvey joined the Board of Directors of MoneyOnMobile,Inc., which offers mobile money solutions through its Indian subsidiary MoneyOnMobile. This venture enables people in India to pay for goods and services and transfer money to other persons via their mobile phones. In January 2017, McKelvey was appointed as an Independent Director of the St. Louis Federal Reserve. In September 2013, McKelvey co-founded LaunchCode, a non-profit organization that aims to grow new talent and create pathways to on-the-job training and employment. LaunchCode partners with companies to set up paid apprenticeships in technology for talented people who lack the traditional credentials to land a quality, high-paying job. In 2014, LaunchCode was named "The Best Thing to Happen to St. Louis" by the St. Louis Riverfront Times. In 2016, McKelvey donated $15M to the Washington University School of Engineering and Applied Science to build a new computer science and engineering building named after his father. In 2019, Washington University's engineering school was renamed the James McKelvey School of Engineering after receiving the largest donation in the school's history from McKelvey. ^ "St. Louis Fed Announces Changes to Board of Directors". stlouisfed.org. 12 December 2016. Retrieved 15 August 2017. ^ Dielman, Susan (24 June 2012). ""Distinguished Ladue Alumni Chosen for 2012 Awards Presentation"". Patch.com. Retrieved 31 October 2016. ^ McKelvey, Jim (1986). The Debugger's Handbook=USCD and Apple Pascal. Wadsworth Publishing. ISBN 978-0-534-06432-7. ^ a b Ebsworth-Goold, Erika (28 October 2016). ""New engineering building to be named for school's former dean"". The Source. Retrieved 31 October 2016. ^ Berglund, John (5 August 2016). ""Rare Company: Jim McKelvey founder of Disconcepts, Square and Launchcode"". Rarecompanybook.com. Retrieved 15 December 2016. ^ Mannino, Fran. "Third Degree Glass Factory Celebrates 9 Years". Times Newspapers. Retrieved 2019-03-28. ^ Cudnik, Christian. "Glass blowing goes public at Third Degree". news.stlpublicradio.org. Retrieved 2019-03-28. ^ Woytus, Amanda (2018-10-18). "Square's Jack Dorsey and Jim McKelvey announce new credit card technology, plan to hire for 300 jobs in St. Louis". www.stlmag.com. Retrieved 2019-04-12. ^ Calhoun, Lisa. ""Why Square's Co-Founder Says Be Wary of Advice From Successful People"". inc.com. Retrieved 2 November 2016. ^ Pontin, Jason. "The New Money". Technology Review. MIT. ^ Cultivation Capital plants $100 million St. Louis Business Journal, June 28, 2013. Retrieved September 2, 2013. ^ "Jim McKelvey, Co-Founder and Director of Square, Joins MoneyOnMobile,Inc. Board of Directors". Market Wired. May 23, 2016. Retrieved 10 June 2016. ^ Lloyd, Tim. "Square founder hopes to turn St. Louis into the Silicon Prairie". Marketplace. Retrieved 6 October 2014. ^ "About - So What is LaunchCode?". LaunchCode. Retrieved 6 October 2014. ^ "Best Thing to Happen to St. Louis St. Louis 2014 - LaunchCode". Riverfront Times. Retrieved 6 October 2014. ^ "WashU announces donation from Square co-founder to grow engineering school". TechCrunch. Retrieved 2019-03-14. ^ Barker, Jacob. "Wash U renaming engineering school after Square co-founder Jim McKelvey". stltoday.com. Retrieved 2019-03-14. This page was last edited on 12 April 2019, at 19:07 (UTC).